Elin Noble: Vox Stellarum will be on display in Western’s Art Gallery from January 16th. Noble will speak at 12:30PM January 17th, which like the show is free and open to the public. Western Wyoming Community College’s Art Gallery will display Vox Stellarum, a fiber arts show from January 16th through February 21st, with a Gallery Talk at 12:30PM on January 17th. Elin Noble is the award-winning author of Dyes & Paints: A Hands-On Guide to Coloring Fabric. Noble has a BFA in Fiber from the University of Washington and an extensive portfolio of exhibitions, classes, lectures, and television appearances. In the series, the silk panels are folded and clamped, and the sericin removed. This process is called de-gumming. By selectively removing sericin, sections of cloth become less transparent. Through the fold and clamp resist process, some of the black color is removed, creating a second layer of pattern. 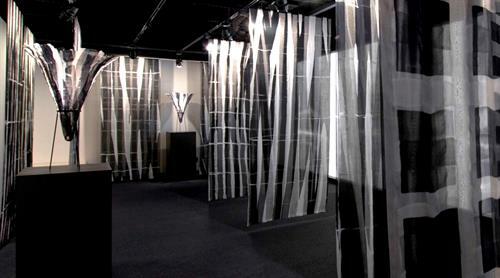 When two panels are hung together as one, these processes allow the two pieces of cloth to engage in a play between patterns, between dark and light, and between transparency and opaqueness. When the cloth gently moves, it also allows for a play of moiré patterns. For more information regarding the event and show, please contact Dr. Florence McEwin at fmcewin@westernwyoming.edu, or check the Mustang Connections App at www.westernwyoming.edu/app. From January 16th through February 21st, with a Gallery Talk at 12:30PM on January 17th.